The cold and windy season is in full swing, although ironically and tragically, so much of Southern California is on fire right now. Although my thoughts are with all the first responders including my firefighter brother, I am escaping the smoke and traipsing off to Canada to go snowboarding! 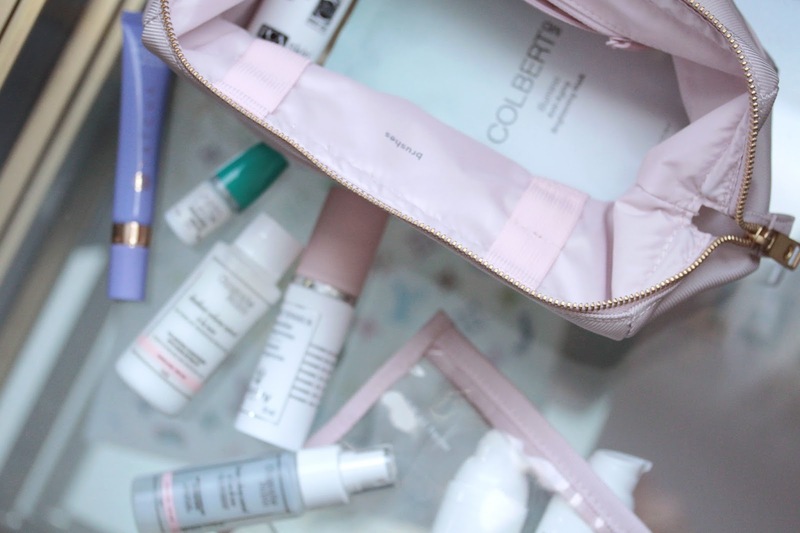 Since the high is about 30 degrees Fahrenheit there, the freezing temperatures and chilly conditions make for a great look at my winter skin care routine. Check out my travel bag after the jump! 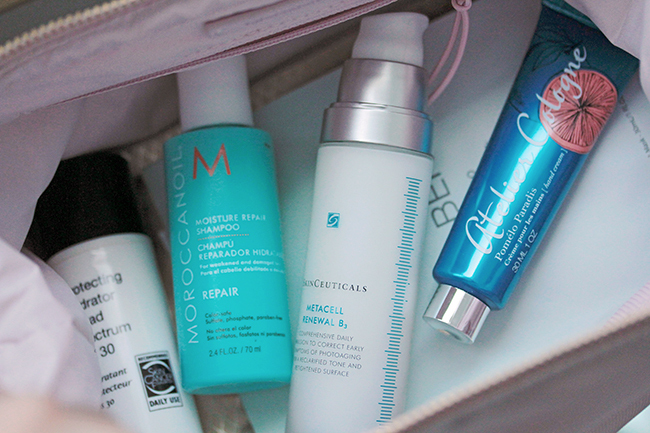 To conserve space, I naturally make the effort to pack my smallest and slimmest products, specifically travel-sized items when possible. Let's start with my pretty purple TATCHA Firming Eye Serum. It has a cooling applicator which helps make my under eye bags significantly less puffy and overall my face less bloated in appearance. 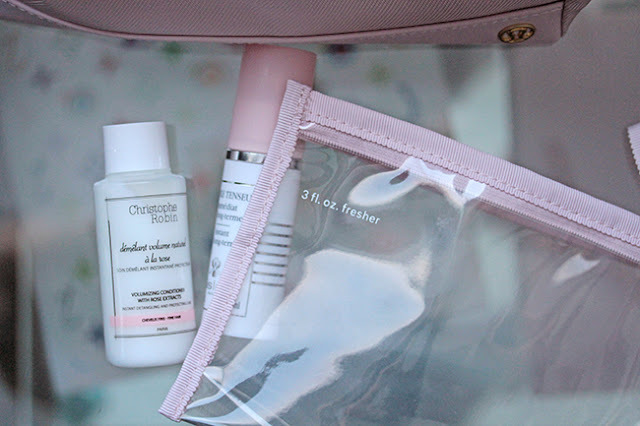 Along with my skin care is my Latisse to help strengthen my eyelashes and my all-time favorite Christophe Robin Rose Conditioner and mini Rosewater Volumizing Mist. Not only do they smell lovely, but they soften and style my hair without stripping my new chestnut highlights. 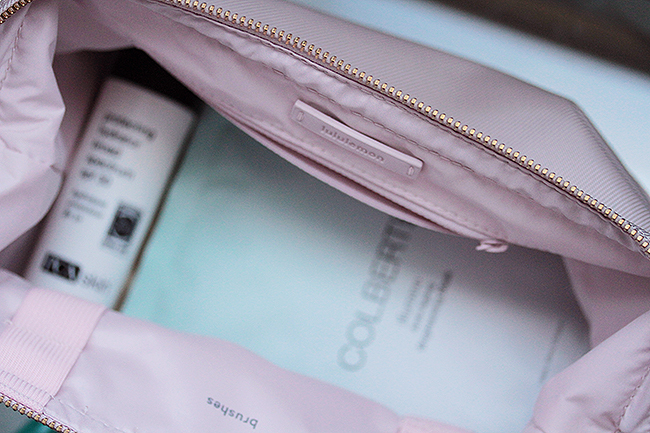 I packed Colbert MD Illumino Brightening Face Masks because I am prone to wind burn and nothing can provide redness relief the way these thick luxurious masks can. They are thick and won't slip or slide around when worn. Most importantly, I see a noticeable reduction in the appearance of my dark spots and hyperpigmentation too. Since my skin is dry to begin with, hand cream is another travel essential in my book! I also use a pea sized amount of hand cream to tame crazy static fly-away hairs that often result from wearing beanies and scarves. My signature scent is Atelier Cologne's Pomelo Paradis so of course I wear the matching hand cream. You'll see this moisturizer featured again soon, but the SkinCeuticals Metacell Renewal B3 is what I apply daily. 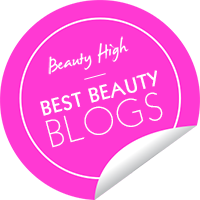 It has such a silky thin texture that absorbs almost instantaneously and the ingredients combat photo-aging and boosts collagen production. As mentioned in my latest pimple covering tutorial video, my dermatologist prescribed two topical medications to combat my acne. 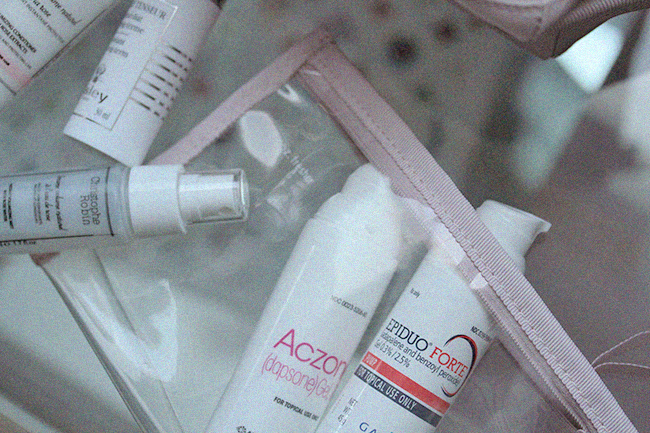 I use Aczone in the morning and Epiduo Forte at night. They are both drying, so I have to make sure to use plenty of moisturizer. Since the formulas are potent, they make my skin more sensitive to sun damage which is why sunscreen is absolutely essential. I use PCASKIN sunscreens, and my favorite from their whole line-up is the Protecting Hydration Broad Spectrum SPF30 because it is so light and doesn't feel greasy. If you have oily skin, it is a true holy grail material sunscreen. 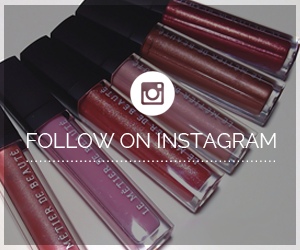 Now we have a couple of my favorites from Sisley, one old and one new. 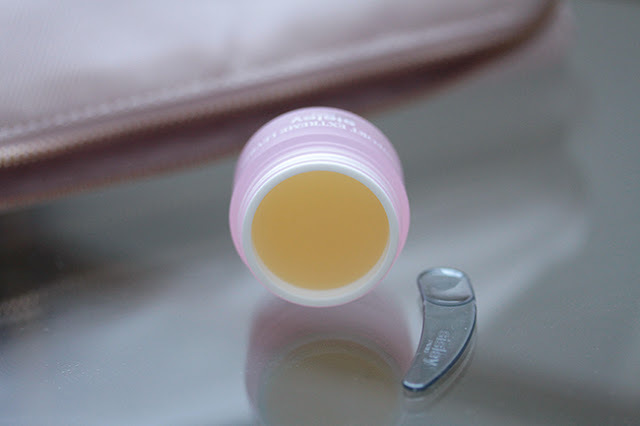 I have raved about the Confort Extreme Nutritive Lip Balm for a few years now. Although the sticker shock might be too overwhelming, absolutely nothing works better on consistently dry, cracked or chapped lips like me. Believe me I've tried everything from Carmex and Blistex to this, and Sisley's plush dense formula is worth every penny. 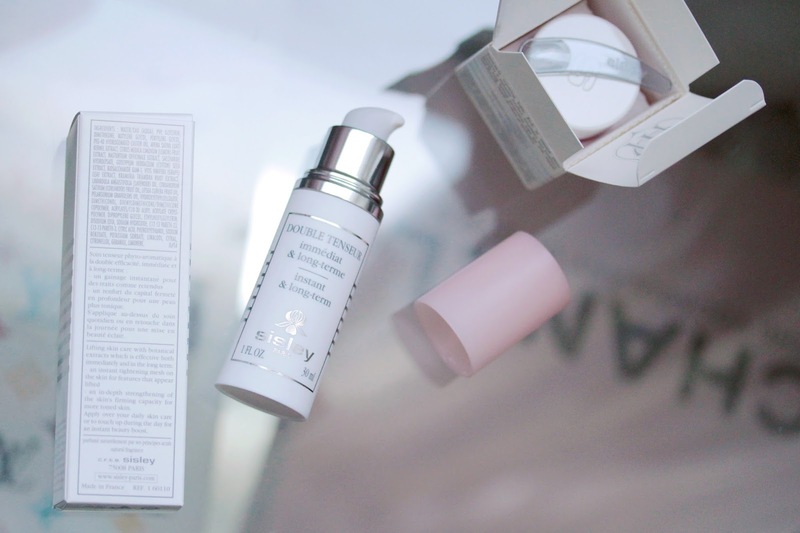 Fairly new and also highly raved about by the online beauty community is the Double Tenseur Moisturizing Gel which is a two-in-one hydrator and primer duo. Everyone I've discussed this gem with loves how it tightens and firms the skin, plus it helps with the longevity of foundation wear. I love using this over my SkinCeuticals moisturizer! Last but not least I wanted to sing praises for my awesome Lululemon Everywhere Kit, which is the second to join the ranks of my luggage. This new Misty Pink version is very similar to one I bought and featured years ago. The material of this particular color feels like a twill weave, which is more formal when paired with the new gold metal zipper, no longer plastic. I do miss the zippered front pouch where I kept tampons, but it is not a deal breaker by any means. The best part about this toiletry bag is the wire frame that stays propped open. The elastic loops for makeup brushes are a nice touch but I rarely use them. 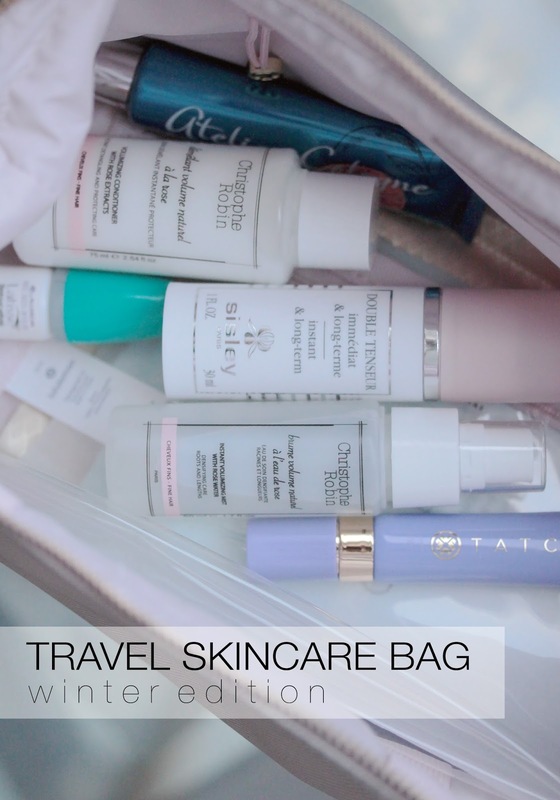 I hope this gave you some travel inspiration where skin care and organization is involved! No matter how hectic or crazy this time of year can get, let's try to take care of our skin, live in the present and strive to do our best daily. I have always struggled with optimism yet my consistent yoga practice and humbling life experiences like acne make it a lot easier to embrace nowadays. I wish you all a very joyous holiday season!